Ahh I'm so excited by these babies! On a recent trip to Primark I picked up a couple of their false nail sets - this fab monochrome striped set and a pink floral pack…for only £1 each! Admittedly, I don't use the glue they come with, instead I opt for my beloved Elegant Touch Brush on Nail Glue, but for £1 the nail art alone is so worth it! As much as I love painting my nails and creating nail art designs, perfectly even stripes like this are just far too fiddly, it's so much easier to just buy them pre-done. These are a nice length, quite a lot shorter than I'm used to but they're much more practical than my claws. This design is such a statement, I was so excited to pair it with my new pastel blue duster coat which I also got from Primark (post coming soon) but they also make a fab addition to jazz up a black and white outfit! 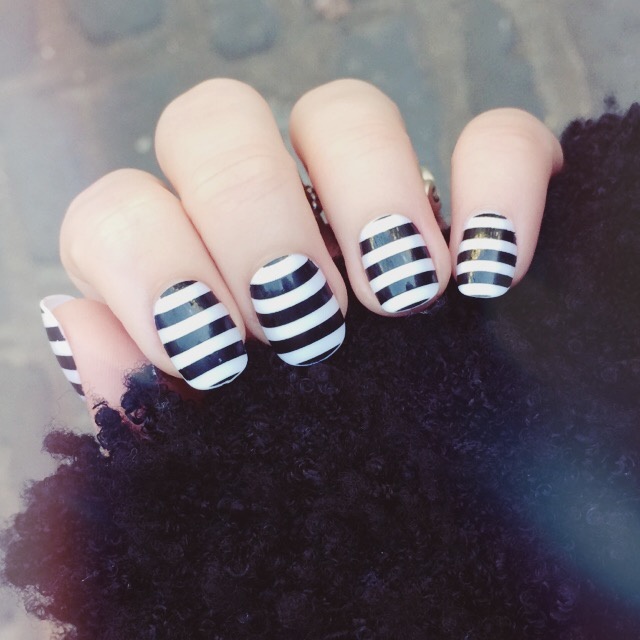 Have you tried Primark's false nails? i got these nails too and used the glue that came with them. The next morning they were all over my bed :( ill have to invest in your trusty recommendation nail glue! I am totally picking up a set of these, they are amazing!